A huge variety of incredible tones from a head you can toss in a backpack. Featuring the incredible tone and flexibility of THR100H Dual in a compact, lightweight single-channel body, the Yamaha THR100H 100W head has got your back whether you're on-stage, rehearsing with the band or practicing at home. With a big sound from a tiny package, the power to dial in the details of your sound and the connectivity to plug you in wherever you're playing, THR100H bridges all the gaps. The THR100H offers huge flexibility and versatility in an ultra-portable head. 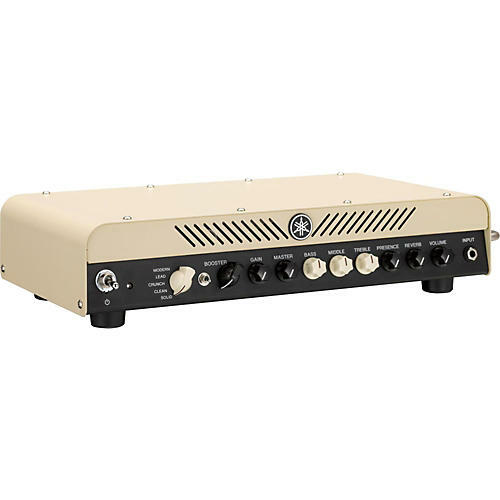 It features emulation of five power-tube varieties, plus five amp-type models, resulting in a massive spectrum of incredible tones you can dial in for any need. Other features include a boost, reverb, a built-in noise gate, FX loop, headphone output and much more. Dimensions: 17.5 in. x 9.7 in. x 3.7 in.